Directly on Smokehouse Bay is a property of extraordinary taste and style called Bayside Club. Located at 828 West Elkcam Circle it offers unique and serene scenery, which is overwhelmed with greenery and mature, plush palm trees. This well-designed structure was built in 1981 consisting of 33 units on four floors with elevator access. Each unit is roomy 1260 square feet. Great Marco Island condo! Unlike some properties, Bayside Club gives its guests the luxury of an exercise room, library, tennis court, social room, and storage for outdoor sporting equipment. Also, on the property is a private pool with a covered area to have an open-air lunch or provide shade from the ever beaming Florida sunshine. Experiencing one-of-a-kind dining and scrumptious, authentic seafood, which delights the very roots of your taste buds is just around the corner. The island’s attractions are never-ending, pleasing even the most particular vacationer. From rugged hiking, and exploring National Parks and Reserves to history and art museums, there is something to do for everyone. Monthly maintenance fees for Bayside Club condos range from $463 - $684 depending on floorplan and, therefore, value. The maintenance fee includes master insurance, cable TV, lawn maintenance, landscaping , manager , pest control, trash removal and water & sewer. Flood and wind insurance always make up the largest share of maintenance fees. Bayside Club has a No-Pets policy. 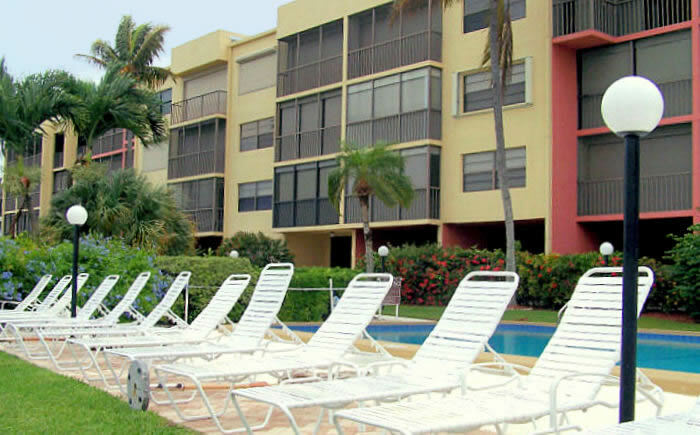 The minimum rental period in Bayside Club is 30 days. In season, everything rents well on Marco Island. Bayside Club is no different. An owner desiring income to offset costs of ownership would have no trouble in season, January through April. However, for the investor that cares only about return on investment, a building that allows shorter rentals, like Angler's Cove, will likely produce more income. There are two different floor plans in Bayside Club. They are both two-bedroom plans but are quite different. One is 1620 s.f. with both bedrooms facing the water along with the living room. The other is a more typically sized 1260s.f. unit. Click here to see all Bayside Club floor plans.